These have been a tough few weeks. I caught a bad cold a few weeks ago and am still recovering. I had to fly to NYC on a business trip and I am not exactly a good flier. And of course, the big one, the financial world as we know it is melting down. We’ve gone from bad to worse to worse yet and there is no end in sight. There are no easy answers. Sell stock or don’t. Panic or hold tight. I have no idea. So I am focusing on the things I can control. The things most immediately around me. This sure is a good time to have a garden. Gardening allows me to do something constructive. There is a clear purpose and I have a clear role in that purpose. I can go out to a tree, pick an apple and eat it. 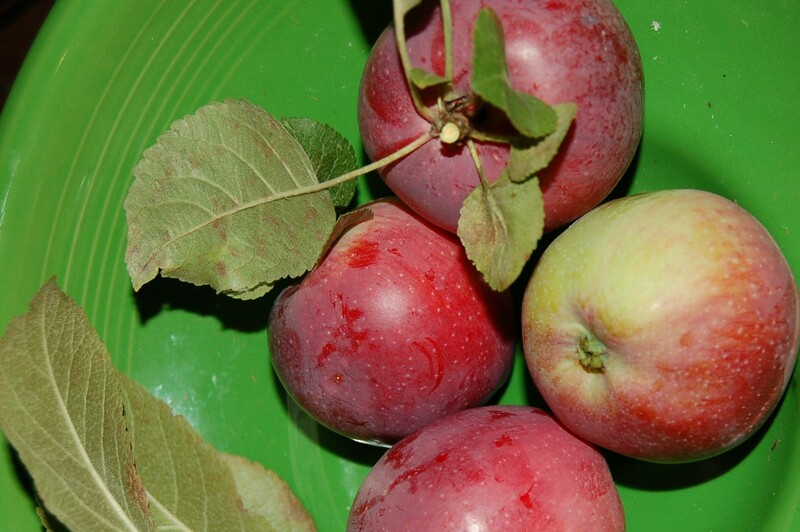 We have some really nice little red apples. And I’d sure rather think about those apples than think about all those things I can’t control. Here’s what we can control, and some of things we’ve been doing. 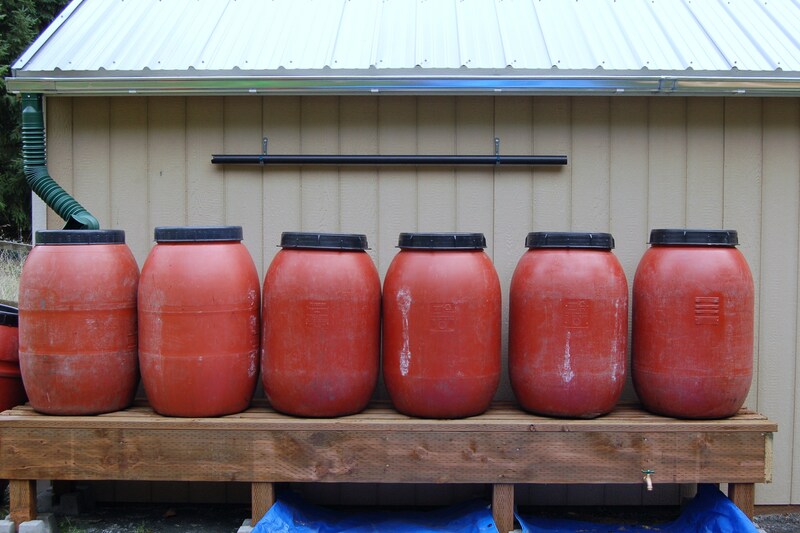 Water barrels. Huge kudos to Derek and my brother-in-law Jeff for setting up the elevated rain barrel system. 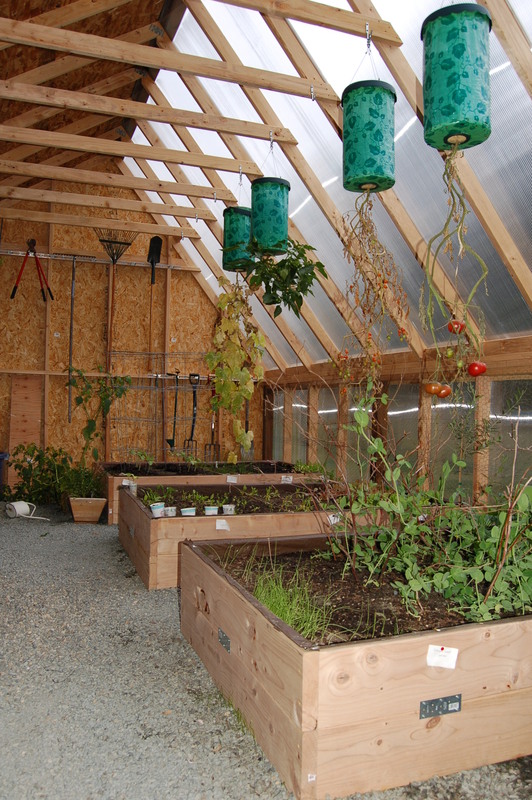 Water runoff from the greenhouse will fill the barrels and then gravity will do its magic when we need water. In addition to the spigot on the bottom of the platform, Derek is also planning to put a spigot inside the greenhouse, by piping it through the wall. We have four other barrels that we are going to set up a bit closer to the house. Mulching leaves. We have a giant big leaf maple tree in our yard. This tree must have hundreds of thousands of leaves on it. It has dropped maybe 25% of its leave so far and they are everywhere already. Today, I spent some time running some of these leaves through an electric leaf mulcher. I am planning to use it as a mulch, covering the outdoor raised beds. 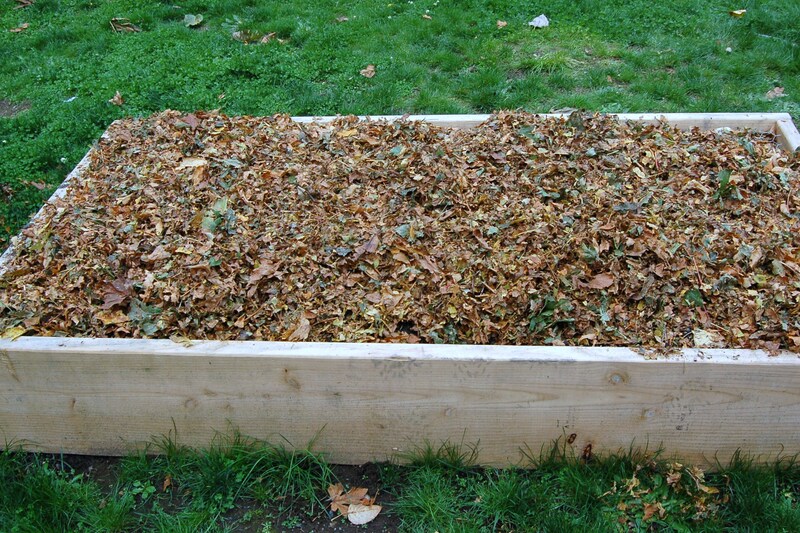 I also plan to use leave mulch for a lasagna garden planting area I am also going to set up. The good news is that I will have lots of leaf material to use. The bad news is that this is a whole lot of work. Seems like the perfect job for my nephew Ryan, if I could get him to come out for a visit. Tending to the fall crops. I’ve planted a number of things for fall harvest: carrots, lettuce, radish, pea pods, cabbage, broccoli. I’ve noticed some problems with what I think are cabbage moths and will be whipping up a recipe from the Terrific Garden Tonicsbook to see if it will help. From the greenhouse, I am also still harvesting tomatoes and peppers and have modest hopes of getting the greenhouse-friendly cuke to grow. As much as I try to keep my mind focused on other things, in the back of my mind I am thinking about emergency plans. Could I rally the neighbors, if needed, to create a neighborhood food production plan? We all have big yards and with a coordinated effort we could probably do a lot. Should we start stocking up on dry good staples? Probably smart from an inflation hedge perspective anyway. Is thinking this way prudent or paranoid? I have no idea, but the little knot that has been forming in my stomach over the last week feels persistent, nagging, urging me to do something. For now, that something is gardening. It’s a good time to have a garden. This entry was posted in Gardening and tagged economic meltdown, fall planting, Gardening, leaf mulch, rain barrels. Bookmark the permalink. Sounds like prudent action…*: ) Taking simple sustainable action in and for your family’s provision is always wise. At the least, your children will learn that simple living brings joy! I am a firm believer that a working four season food production garden and a VERY well stocked pantry are the best insurance policy you can invest in. What other insurance policy provides benefits even when not paying out in an emergency situation? The garden and pantry sure do! They provide economic and health benefits year round – and yet stand ready to cover during personal financial crisis or during natural disasters etc. as well. Let me start by saying you only lose money in the stock market if you sell (or the company goes bankrupt, which is a possiblity). Especially if you’re our age and have a long-term investment window. I personally have 30 years so I’m less concerned with the 25% hit I’ve taken in my retirement savings. It’s worrisome, but I’ve always had a saying that I try to live by. If you can’t control it, don’t worry about it. If you can control it, don’t worry about it, do something about it. Of course, that’s exactly what you’re doing by focusing on what you can do right around you. Getting your financial house in order, stocking up for unknown hard times and lowering your expenses. Way to go! Let the other guys panic. We know we’re secure in our footings. That’s what counts! Agree with Sinfonian. Let the others worry. You’ll be able to feed your family – and probably several neighbors – which can give you a wonderful sense of peace. This is actually why we’ve started our blog…to encourage others to begin these type of preparations. One neat tool I found is the “Map Your Neighborhood” program that just about every county in the US offers. Google it for your county. It’s a great set of tools you can use to rally the neighborhood.